Like has been mentioned in the first article that Jawara’s administration has its own deficits not withstanding the numerous development in terms of democracy, peace, rule of law and order people had cherished and enjoyed during all those years of his administration. However the second republic led by President Yahya Jammeh had its ow story that also need to be told. On a fateful Friday morning of 22nd July 1994 The Gambia and her history has been changed and rewritten by Lt Yahya Jammeh and Co who led a military coup against a democratically elected government in The Gambia. 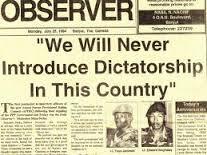 The premise of the coup was there was that there was rampant corruption and lack of accountability in Jawara’s 29 years of governance and the military came to salvage the country from that. The initial propaganda from the then military government called AFPRC was they will not stay no more than two years in power and no other leader could rule for more than two elected terms of five years each but that’s where those promises started and ended. Meanwhile, to begin with positives if there is or was any, it is during President Jammeh’s tenure that the country has had her own television station called GRTS which was opened in 1995 a year after he took power, however, the TV station has been monopolised by Yahya Jammeh since then as he is on record to say that the TV station belongs to him. Furthermore, it was Jammeh’s administration who first brought a university education in the country which is helping the country to proudly produce her own locally trained medical Doctors albeit most of them needing further training in advanced institutions outside the Gambia. In addition, during Jawara’s tenure there was fewer primary, secondary and high schools which led some students trekking 10s of miles every school day, but most of that seized during Jammeh’s administration by increasing the number of schools in the entire country especially up country. Also there has been an increased in the number of feeder roads, main highways and bridges which made the movement of people lot easier now than during Jawara’s time more so those in the North Bank of river Gambia, Badibu and the rest. Hospitals have also increased in number from two to five but most of which are white elephant projects as they either lacks Doctors or medications which led some critiques arguing that the country needed doctors and medical equiptments and drugs but not all those hospitals built by Jammeh’s administration. However, Jammeh administration’s first atrocity was to seized power from people and the second one was the murder of the then Finance Minister of AFPRC government Ousman Koro Ceesay and all the evidences are pointing fingers to Jammeh and his men but up to this hour no body has been held accountable for his murder. Meanwhile, Koro’s murder opened the flood gate of murders in The Gambia since 1994 up to now. November 11, 1994 also saw the brutal murder of alleged coupist led by the then Lt Barrow and Co. Meanwhile, fast forward to 10th and 11th April 2000 which were another fateful days in the country’s history that witnessed the gruesome murder of 16 innocent students and maiming of hundreds more by Yahya Jammeh just by exercising their God and constitutional rights to hold a peaceful protest to demand justice for their colleagues. However, for now Jammeh has ensured that no body is accountable for those heinous crimes by indemnifying the murderers of the students. As was highlighted in the first article, the Gambia used to be a tranquil country where everyone was your neighbour’s keeper but now, Yahya Jammeh has turned the country into a police state where you cannot even say his name without saying anything positive about him else you brace yourself for an arrest and subsequent torture. Now the security forces can killed, torture and falsely imprison anyone in the country with impunity just like they did to the students in April 2000 and recently to Ya-Binta Jarju as well as Minah Manneh and many other people in the country. The Gambia has been turned into full fledged dictatorship in the 21 years of Yahya Jammeh’s misrule and irresponsible way of running the affairs of the country, which led to the country’s lost in all credibility in the sub-region and beyond. Jammeh has also been linked with the 2004 massacre of 44 Ghanaian migrants and 10 other ECOWAS nationals at a forest in Brufut. Yahya Jammeh became the first leader to pull out of the Commonwealth unilaterally since President Robert Mugabe chose to withdraw Zimbabwe in 2003. Jammeh, who claims to have personally discovered a cure for Aids, has been accused of widespread human rights abuses, notably by ordering a national campaign against “witches” in which over 1000 people were forced to drink poisonous concoction. The Gambia as was known ‘The Smiling Coast’ used to enjoyed stable and vibrant economy which was dictated by natural economic forces and supported by effective and efficient public and private sectors during Jawara’s tenure but those are history now. The jewels of the nation Gamtel, GPA, GIA, GCAA, GGC, NAWEC etc have all been bankrupt by Yahya Jammeh thanks to his lack of fiscal and economic discipline and unwanted interference with economic forces. Jammeh meanwhile, continues to be richer than the entire country as he engaged in all sectors of the country’s economy which is categorically forbidden by the constitution of the Nation, however, becuase he is the judge, jury and executioner at the same time, nobody in the dare challenge him else you find yourself either six foot deep the ground or in Mile II in which the later is the best case scenario for you. Meanwhile, Yahya Jammeh’s crimes and failures are never ending as journalist like Dayda Hydara, Chief Ebrima Manneh, lawyers like Ousman Sillah, politicians Femi Peters, Amadou Sanneh, ordinary citizens like Binta Jarju, Minah Manneh, the list goes on and on, have all been victim of Yahya Jammeh’s crimes. If there is anything the Jawara and Jammeh’s regime shared in common is longevity which in 1994 the people decried Jawara’s regime of but its clear now that Jammeh is even going to be worse than Jawara as he planned to stay for at least a billion years in power. However we shall see.